Aurora fNIRS takes a whole new approach to user instrument control and data acquisition. With it, NIRx delivers intuitive, flexible, and easy-to-use software for the portable NIRSport 2 fNIRS solution. Aurora fNIRS connects to your NIRSport 2 device(s) via Wi-Fi or USB, and can set-up a complete experimental configuration in only several clicks. Thanks to the automated signal signal optimization algorithm, Aurora fNIRS ensures optimal signal quality before a measurement is started. Raw data, HbO and Hb concentration changes can be visualized in real-time in several display modes. In addition, high-end whole-head visualizations are immediately available. Recorded data can be exported over the integrated Lab Streaming Layer (LSL) protocol, allowing for real-time processing in Brain-Computer Interface (BCI) and Neurofeedback paradigms. Aurora fNIRS: revolutionary fNIRS acquisition software by NIRx, available for the NIRSport 2. 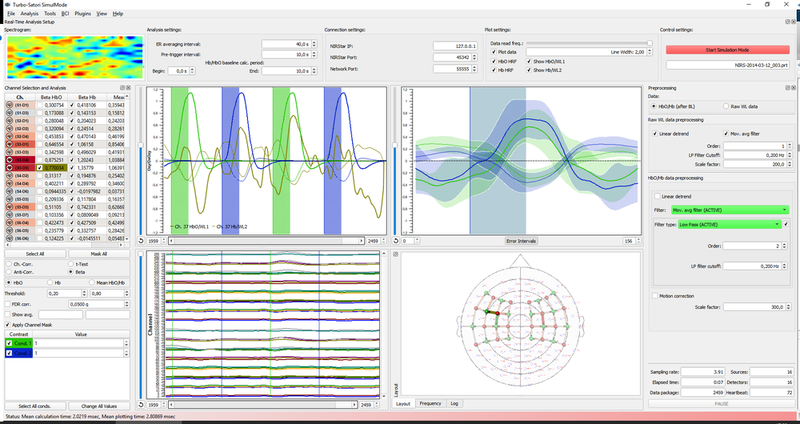 Turbo-Satori is a user friendly, real-time analysis software for functional near-infrared spectroscopy (fNIRS) data. It is developed by Brain Innovation, exclusively for NIRx fNIRS instruments. Turbo-Satori is compatible with the NIRSport, NIRSport 2 and NIRScout device, and can be used in both lab-based as well as open environments (mobile studies). It integrates with NIRStar or Aurora fNIRS without the need for any additional hardware. NIRStar is designed to function as a multiplatform instrument controlling environment that offers maximum flexibility to support the many investigational paradigms that the NIRx line of NIRSport and NIRScout functional imaging systems can explore. Whether the aim is to perform mobile studies with the NIRSport or high density hyperscanning measurements with the NIRScoutX, NIRStar gives you a wealth of system control and real-time display capabilities that are designed to maximize the investigational opportunities accessible with NIRS. nirsLAB™ provides users a feature rich statistic parametric mapping environment designed to meet the most demanding neuroimaging study. Whether your study involves child or adult subjects; mobile or hyper-scanning environments; nirsLAB™’s GUI-based tool boxes provide the resources to easily edit and explore the many neuro-response features accessible by NIRS imaging technology from NIRx. Equipped with individual and group level (MNI) atlases, single and multi-subject findings can be quantitatively evaluated and mapped in a variety of display formats. nirsLAB has been developed in cooperation with the Optical Tomography Group at the SUNY Downstate Medical Center.